Weatherman predicted scattered thunderstorms all day (and that’s pretty close to what happened!) But the sun peeked out enough to help with lunch. 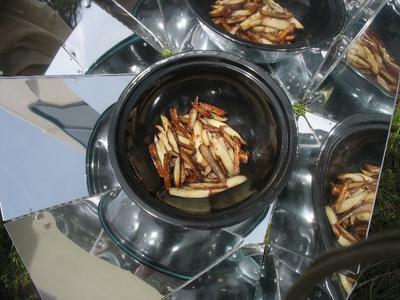 We put some leftover homemade French fries in the Hot Pot. Even with moderate cloudiness, they were pleasantly warm in 20 minutes—fun!! If all goes well, we will be trying several foods in the Hot Pot this week. Look for more recipes from me soon!